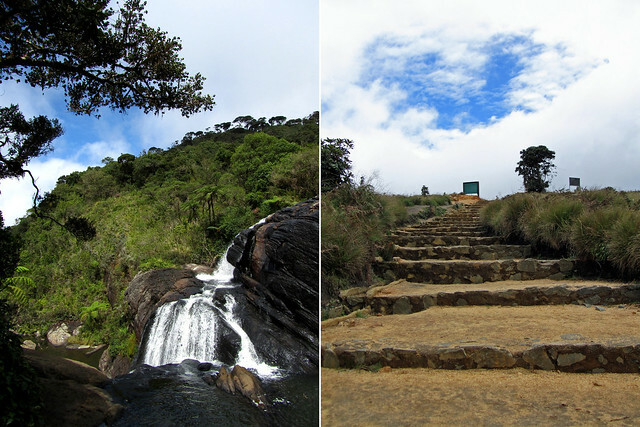 We finally entered the Horton Plains National Park via Pattipola and proceeded to obtain our tickets (US$20 per person + additional vehicle charge). Not only were we battling rain at this point, the wind was also strong, prompting us to wonder if we’d made the right call to hike that morning. Luckily we did wrap up well so at least we were not cold, even if we looked like something the cat dragged in. Our raincoats/ windbreakers also came in handy to shield us from some of the elements. After another short drive, we finally came to the starting point of our walking trail. And perhaps luck was on our side afterall – the rain stopped, the wind died down and the sun started to peek out among the clouds. Consulting the route map, it appeared we would be doing a rather circular trail, with three main points of interest to look out for – Mini World’s End, World’s End and Baker’s Fall. 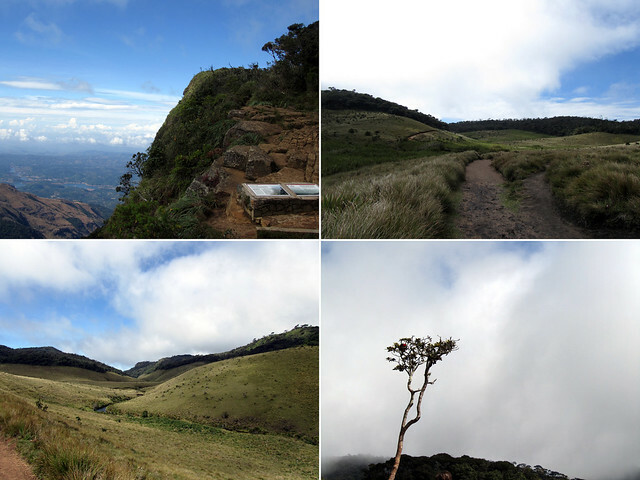 We would cover approximately 10km in distance and it must be noted that this is the only national park in Sri Lanka in which one can walk freely (following the designated path, mind) without a guide. After consulting a guide map near the start of the trail, we turned left and took off in the direction of Mini World’s End. Our thinking behind this decision – it’d be better to view the Mini World’s End first ahead of World’s End. Apart from the paved few hundred metres from the starting point, the remainder of the trail was just good ol’ trampled paths of red-yellow soil peppered with rocks and pebbles, lined with low lying bushes and framed by taller trees and bamboos in occasional stretches. Soon enough, we found ourselves peeking at the Mini World’s End. Ok, you must be wondering what’s the deal with the World’s End, mini or not. World’s End basically refer to the feature of this plateau where the edge fell in a straight drop manner to the valley. Not gentle slopes there. It was as if the earth just collapsed in a vertical column. At Mini World’s End (or Little World’s End or Lesser World’s End), the drop is not quite as pronounced, measuring nearly 300m, but at World’s End, just under 900m separates the standing edge and the solid ground below. That’s higher than the height of Burj Khalifa, the tallest building in the world. It’s a very long way down this impressive precipice. The views from Mini World’s End and World’s End were nearly identical when you cast your eyes in the horizon. They were absolutely gorgeous. Sun was shining overhead, the sky blue as it could be, and somehow the misty cloud covers that came and went made it all seem ever more romantic. This phenomenon of low cloud cover is common enough to earn national park the name of cloud forest. We had a little snack pause at World’s End and took our time basking in nature’s beauty. 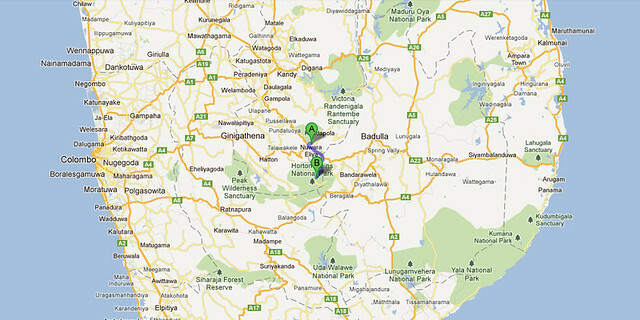 Over on one side, Nilan was back talking on his phone (yes, mobile phone coverage even here!) when not moonlighting as our photographer. Since it was also getting progressively warmer, we began to shed a layer or two of our clothes. We didn’t encounter too many people (nor wildlife for that matter – except for a sambar deer and some birds) along our walk. I supposed, given the nature of the circular trail, it would be unlikely to bump into other people unless (a) they stopped en route and we caught up with them, or (b) they started in the other direction. Most of the other walkers that we ran into were groups of locals or visitors from the region, and only a Caucasian couple at World’s End. I was assuming Horton Plains may not had been as interesting as Adam’s Peak and so the other foreign tourists had gone to Adam’s Peak to chase the Buddha’s footstep instead. The final sloping trail (uphill of course, just not to make things too easy) seemed to stretch indeterminately in front of us. We had, overall, made good time with our walk, completing the trail in just over 2 hours. As we approached the end of the loop, we saw more groups arriving, eager to start their walk. I wasn’t entirely sure if they would enjoy walking under hot sun though, as the temperature has been climbing steadily as time passed and I was desperate to change out of my gear into a maxi dress to cool down. One last thought of the day – the tuk-tuks. It was incredible to see them up at Horton Plains, given the amount of work it’d required from the vehicle to make the climb up the long and windy road. 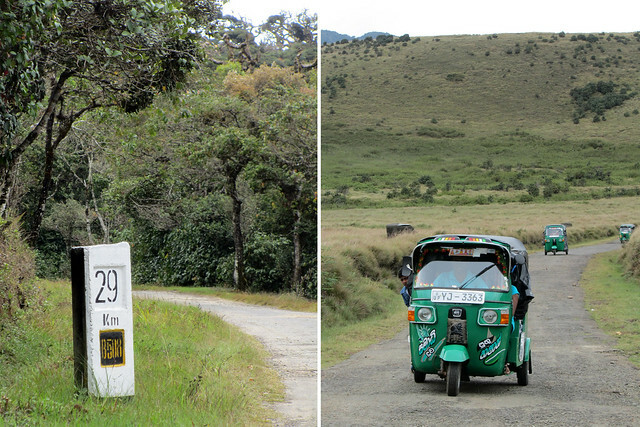 If a van felt the strain from the drive up, imagine how it could be on a tuk-tuk! Anyway, don’t forget to check the Flickr photoset for the rest of the photos from this walk. I truly enjoyed it and sitting at my desk in a crowded city right now, what I would give to be out there again for a few hours. The Cheese Diary: January 2012 What makes you happy? How early in the morning did you start your hike to avoid the hot sun and too many other tourists? We arrived there just after 7am.